Jennifer E. Smith is becoming known for two things: (1) light, satisfying contemporary YA romances and (2) novels with really long titles. This Is What Happy Looks Like is indeed a good illustration of "happy." 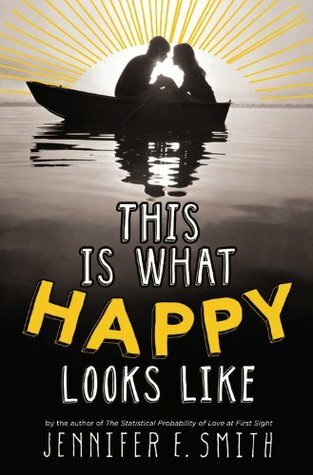 The world looks like a happier place after reading this book. You'll have a spring in your step. This Is What Happy Looks Like is yet another version of a beloved plot: regular girl meets big time movie star. Movie star falls in love with said girl. It's a plot that, no matter how many times it's done, I almost always enjoy. Somehow Jennifer managed to make the story arc feel original - or if not original, fun enough that you don't care. Ellie and Graham are both nice people. Nice is such a blasé word, but it's really the best way to describe the characters. Ellie in particular is simply nice. She doesn't have a describable personality. She's not a firecracker, she's not shy, she's not mean, she's not vivacious. She's a regular teenage girl who can be a little bit of all of these qualities. By not having an overriding personality trait, Ellie felt more real to me than many other protagonists. Graham is also best characterized as nice, but his personality stuck out to me more. He's passionate about acting, he's funny in a gentle way, he's bookish, he's sad. Graham's sadness over his loss of freedom and his estrangement from his parents struck me more than anything else about him. I really liked Graham. He stands out from many other YA male love interests by being sweet in an unassuming, boyish manner. The book is told in alternating points of view of Ellie and Graham, a writing technique that I increasingly like. It allows me to get to know both characters better. At the start of each chapter are emails between the characters, which is how Ellie and Graham's relationship began. Kind of like Seinfeld, these email chats are often about nothing. They are more cutesy that witty...in a good way. It was occasionally hard to follow who wrote which email or on what day it was written, because my eyes automatically skipped the To, From, and Date portions of the email. Is This Is What Happy Looks Like as good as The Statistical Probability of Love at First Sight? No. I can't really describe why. I've read other reviews that were disappointed in this book, because it approached the precipice of excellence but didn't quite make it. I was quite satisfied with the book's fun simplicity, but that was partially because I went into it with low expectations. There's just something missing that keeps this book from being really special. Regardless, it's a lovable romance and I'd recommend putting it on your shelf for a cheering up kind of day. I love light romance and your review has prompted me to add Happy to my TBR pile. Thanks! I DO love the "regular girl meets famous guy" plotline, I have to admit. It's fun and what daydreams are made of, right? Plus, I do love a good romance! I have Statistical on my shelf for such a long time and I still haven't gotten a chance to read it yet, if I enjoy it I just might try this one out. I really think the plot sounds adorable though. I really enjoy the dual perspectives in books, so this sounds like it could be a winner. I really enjoyed this one too Alison, though we seem to be in the minority as far as I've seen! I just had a good time reading it, I didn't go into it expecting it to be gut wrenching or overly emotional, and so I was just able to sit back and enjoy it for what it was. I was confused as to who was writing the emails sometimes as well, particularly in the beginning, but I still loved reading all their exchanges! Hmm..Statistical didn't really grab me and the description for this one isn't all that exciting. I do think the cover is adorable though. Glad you liked it! I'm glad to hear that you enjoyed this! I've also read a few lukewarm reviews, and my expectations are pretty low right now, so hopefully I'll enjoy it for the light romance it is. Great review! Okay, I've got to ask, because everyone loved The Statistical Probability and I had serious issues with it due to the divorce-topic that hit too close to home.. Is there one of the following things in this book? I've heard really good things about this one. I'm glad to see that you liked it too. I'll have to check it out some time. I just finished this one a few days ago and really enjoyed it. I actually enjoyed this one more than Statistical Probability, but that may be because I knew what to expect from her writing style, so I wasn't disappointed. And I completely agree with you about things feeling happier after reading this - I definitely had a smile on my face the rest of the night. I love how you describe Ellie! I didn't realize it before so much, but you are exactly right! I also really liked the alternating perspectives. I like knowing what's going on in the other ones head. Glad you had fun with this one too! I am just about finished with this. I think I only have a couple chapters to read. So, I should be done by tomorrow. I'm not sure if I'm going to be getting any reading in tonight. Now I have to go back and read the Statistical Probability, which is still on my TBR pile. Loved the review Alison. I need a good romance to help lighten up my mood. I'm glad you enjoyed this, this is the most positive review I've seen of this book so far, most readers seem very disappointed in it, but I still want to read it. Wow, I agree with everything you had to say about This is What Happy Looks Like. Ellie and Graham are just so nice. They're nice people. I actually preferred Graham's part of the story more than Ellie's which is rare for me. I almost always like the female role best in books. What I do find interesting is that in both Statistical and Happy, the female character has some problem with her father. I do feel like quite a few things were left open, for example Ellie never really resolves anything about her father. But I definitely enjoyed this and also gave it four stars. I like the sound of this one. It reminds me of Tammara Webber's Between the Lines series. Definitely a cute novel. It's a short read, but worth it. I would recommend this book to anyone who likes an adorable romance.